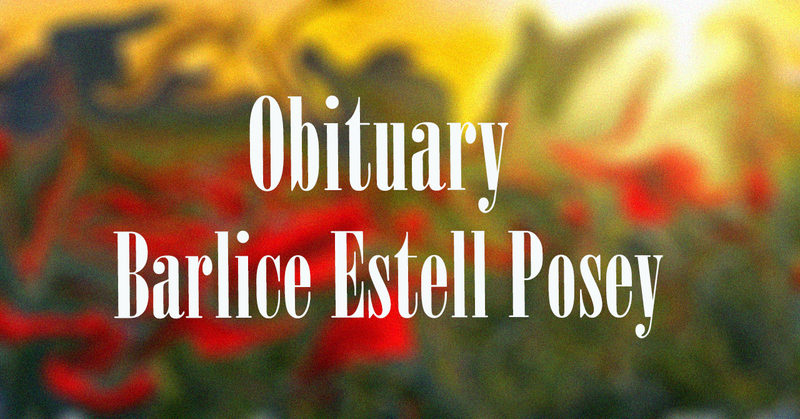 Funeral service for Barlice Estell Posey, 88, of Cullman will be at 2 p.m., Monday, December 28, 2015 at Cullman Funeral Home Chapel with interment in Cullman City Cemetery, Revs. Stanley Reeves and Perry McCravy officiating. Mrs. Posey passed away Friday, December 25, 2015 at her residence. She was born March 1, 1927 to parents, J.C. & Elsie Gray Stephens. She was a teacher’s aide at Logan Elementary School from 1967 – 1988 and was a member of Pine Hill First Congregational Methodist Church. She was preceded in death by her parents; her husband, Wenzel Posey; brothers, Gray Stephens, Samuel Marvin Stephens; sister, Doris Knight Kelly. Survivors include her children, Quinton and Janice Posey, Wazanta and Dennis Johnson, Warren and Shirley Posey; grandchildren, Heith and Melissa Johnson, Denell Johnson, Tawanta and Stephen Jenkins, Mike and Stephanie Hill, Sharon Westmoreland; great-grandchildren, Kaden Johnson, Levi Johnson, Makayla Johnson, Isaiah Jenkins, Lilyanna Jenkins, Cody Westmoreland, Makenzie Hill, Madison Hill, Natalie Hill and awaiting baby Brantlee Jenkins; and a host of family and friends. Visitation will be Sunday evening at the funeral home from 5:30 p.m. until 9 p.m. and on Monday, from 9 a.m. until 2 p.m.
Friends may sign the online guestbook at www.cullmanfuneralhome.com.